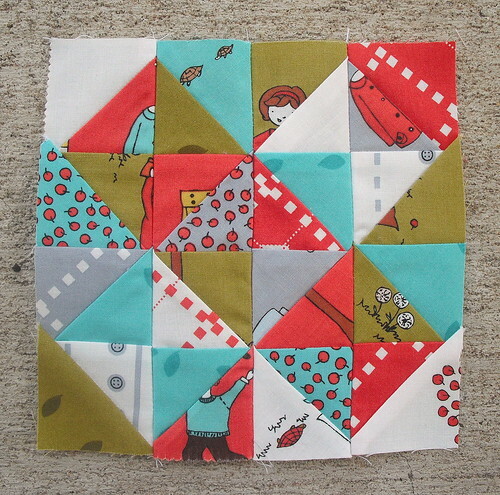 I've got a fun one for you today - Farmer's Wife block 11, Broken Dishes. 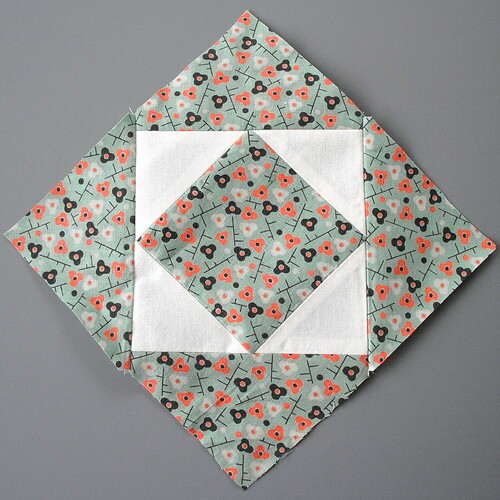 My first paper pieced block for Farmer's Wife! 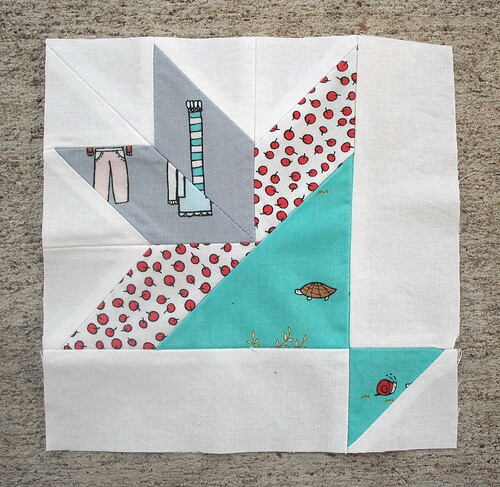 It turns out that I really enjoy paper piecing these blocks. Look at how perfect those triangles turned out! The sad part is that I didn't do the scaling right when I printed it, so it's not the right size. So I'll save it for something else (part of the backing? a pillow? 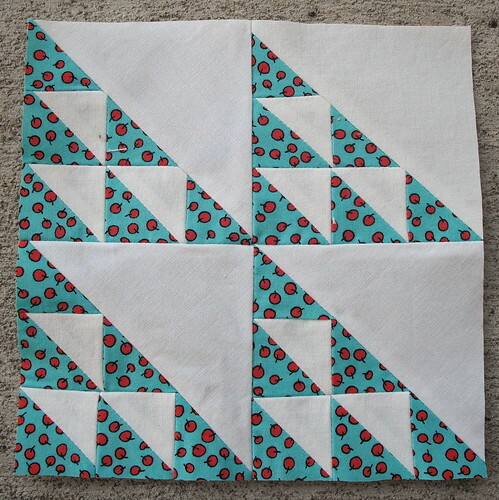 ), and redo this block with the correct size. 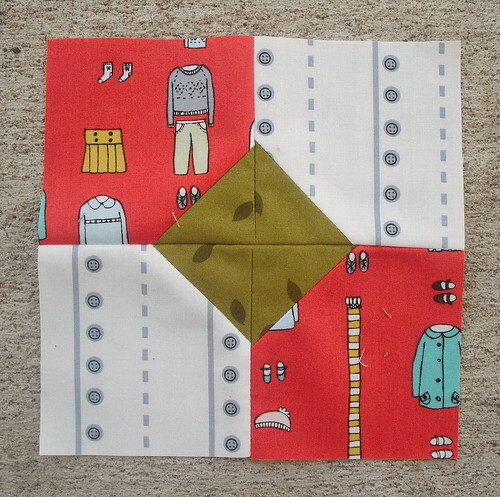 Here's my next Farmer's Wife block, Bowtie. What's fun about this one is that either color, red or white, could actually be the bowtie. Another Farmer's Wife block from the reboot, this time, Box. I used starch, but somehow I still ended up with lumps. (They look worse in person than on camera.) I'm going to re-do this one with the same fabrics but with paper piecing, so hopefully that will eliminate any lumps from forming! Here's my eighth Farmer's Wife block in my reboot, Bouquet. I especially love the little turtle. And the snail! 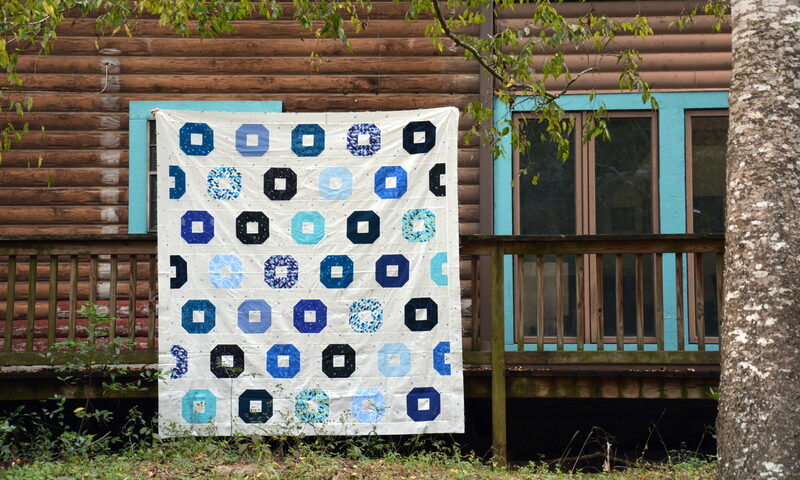 In a little bit of spare time I had, I put together another Farmer's Wife block. This one is number 7, Birds in the Air. I'm pretty pleased with how this one turned out. I used a bunch of starch to keep the triangles from deforming, and that seemed to do the trick. Still loving the little apples. too. I've been in denial, guys. I haven't been happy with my Farmer's Wife blocks in quite a while. I expected to like the reproduction prints a lot more than I actually did, but I kept plugging on. And on. And on. They haven't grown on me yet, and it's been nine months. I couldn't let myself continue on and make 111+ blocks and end up with a quilt top that I didn't like. So, I've started over. And now these, I LOVE. I mean, seriously. Red, grey, green, aqua, and white? Little kids running around, trees, squirrels, turtles, and apples? Love. This is already so cheery and wonderful, and I've only done six blocks! The line is Little Apples by Aneela Hoey, and I had a bunch already in my stash, so I didn't even have to buy anything for my reboot. Hopefully you'll see many more blocks now that I'm excited about them again. And don't worry, the old blocks won't go to waste. I'm mulling over some ideas for them! 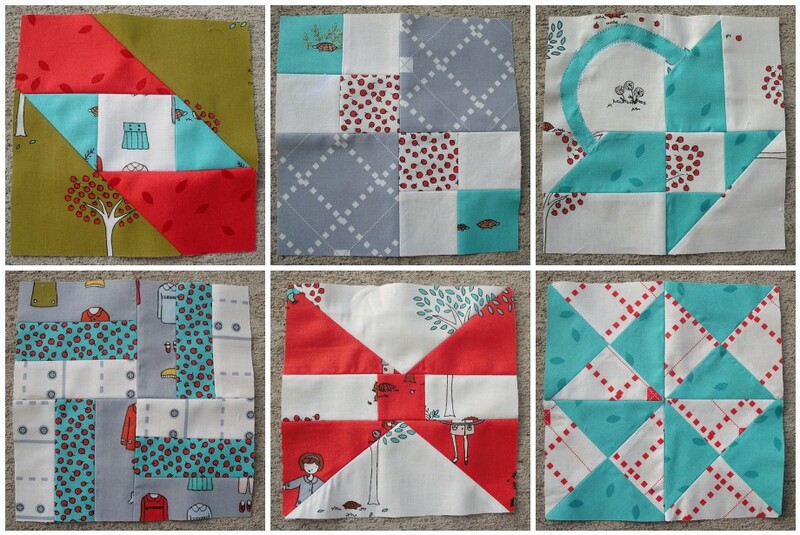 Last week I redid a couple of blocks that I was unhappy with for my Farmer's Wife quilt. First up was Block 29, Economy. I was really unhappy with how my first one turned out; it had way too much white and was really boring. I swapped the two colors per Amanda's suggestion, and the result was absolutely perfect. So much better! I also redid Block 18, Century of Progress. I didn't like how the book laid it out to be non-symmetric, but now it is. Woohoo! Block 25, Cups & Saucers. Block 28, Duck and Ducklings. Block 30, End of Day. And here are blocks 1-30 (minus block 26) all together. Looking good! 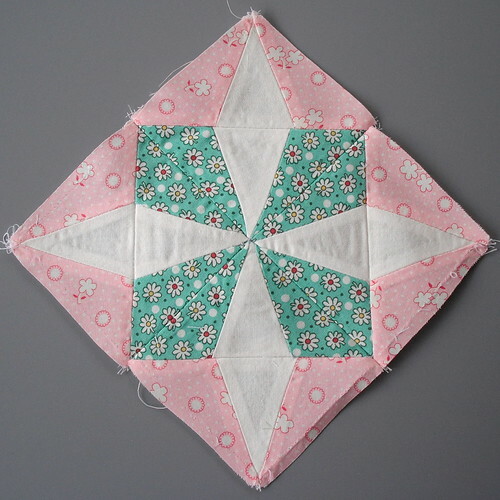 Here are my next two Farmer's Wife Quilt-Along blocks. Block 22, Corn & Beans. I wasn't looking forward to putting this one together, but it ended up better than I expected. I think I might actually like how it turned out. Haha! Block 23, Country Farm. I love, love, love this block! It's such a pretty star, and somehow I ended up with the perfect color combination. This very well may be my favorite block so far! My friend Amanda made some mini design boards for her Farmer's Wife Quilt-Along blocks, so I copied her and made some too. The tutorials for these can be found at Bee In My Bonnet here and here. Such a simple tutorial for such a smart idea. 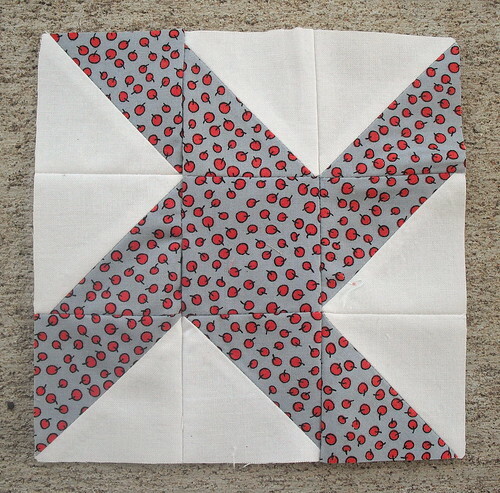 I used some Ta Dot quilting tape scraps for the edging. These are really going to help in laying out all the pieces for the quilt-along blocks, so I'm really excited to start using them!